In a recent post, I shared a reference implementation of an innovation funnel built on the Continuous Innovation Framework and cautioned that while funnels are powerful visualization tools, they have their limitations. The biggest limitation is sub-funnel optimization which, in this case, is one of the leading causes for Innovation Theater. Real and meaningful funnels typically have long lifecycles which take time to study. 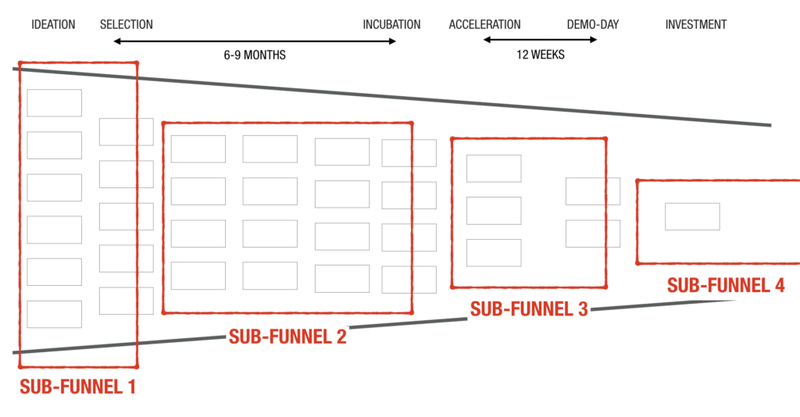 Innovation funnels, for instance, need at least 2–3 years to go from idea to product/market fit. and assign different groups of people (departments or organizations) to optimize them. This divide and conquer approach seems logical but it favors local optimization at the expense of longer-term system throughput i.e. real results. This problem is even further exacerbated when we attach incentives to these local KPIs. If you simply incentivize marketers to drive more leads, your ad budget gets spent and you get more leads — but longer-term conversion rates tend to go down. If you simply incentivize salespeople to close accounts, magically accounts close usually towards the end of the month. If you study longer-term effects, you find that accounts closed during the last week of the month tend to churn more than others. If you simply incentivize software developers to write more lines of code, more lines of code get written, but performance and quality suffer. Thankfully, we have done away with many of these policies. However, in some cases, we have still only replaced old local KPIs with a new local KPI — like build velocity over lines of code. Building something nobody wants on time and within budget is still not the right metric. In the world of innovation, if you incentivize innovation managers simply to run hackathons or launch accelerators, the money gets spent: t-shirts get printed, foosball tables get purchased, Lean Canvases get hung. But these aren’t the right metrics either. I once had a conversation with an accelerator that had low follow-on investment after their Demo Day. Their teams were really early stage and 12-weeks just wasn’t enough time for acceleration and education. My suggestion was raising the bar on their application process and requiring their teams to level up on some basic business modeling concepts. They were afraid this could create too much signup friction and feared that the number of applications would drop which wouldn’t look good to their stakeholders. So they chose against it. Even well-intentioned key activities, like running customer interviews, can be gamed when framed with the wrong incentives. The NSF I-Corps program, for instance, requires that scientists run 100 interviews as a pre-condition to securing a grant. Guess what? Exactly 100 interviews get run! How about pairing startups with corporates? Startups need customers, corporates need innovation. The perfect pairing? Not so fast… I’ve seen some great short-term ideas come from this kind of pairing. The problem again is the longer-term. What do corporates then do with a promising startup idea? How do they (or should they) integrate them back into the mothership? In each of these cases, people are attempting to optimize for the shorter-term sub-funnel but then getting stuck deeper down the funnel. You have to start with a holistic view of the funnel. The antidote is thinking in terms of systems, not funnels. A key attribute of systems is the razor focus on a single macro metric (not a sub-funnel metric) that matters: Throughput. 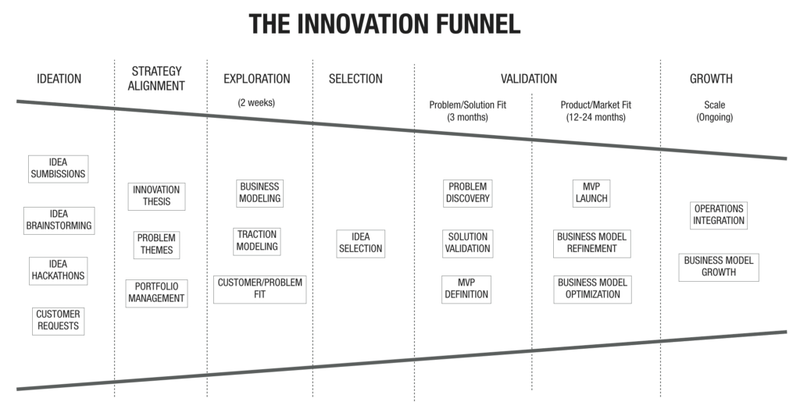 Throughput in the innovation funnel can be measured in terms of the rate at which we generate successful ideas. But this is again subject to gaming. What does “success” mean? The good news is that we already have a well-defined single metric for measuring this: Traction. 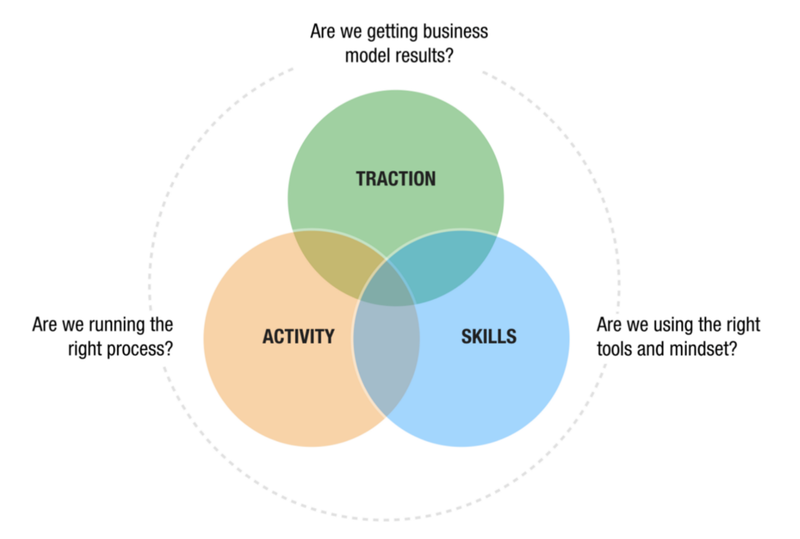 Traction is the rate at which a business model captures monetizable value from its customers. Traction can be further deconstructed into 7 key metrics which can be used to consistently measure any idea at any stage against a traction roadmap. Sure, some of the activities up above (like running customer interviews) are really key. I am also not against creating a different and fun work environment. I think that’s important too — especially given that you just asked your best teams to give up their familiar jobs and embrace a world of uncertainty. Innovation in the new world inevitably requires teams to unlearn old habits and learn new skills. This is uncomfortable and hard to sustain without positive reinforcement and small rewards along the way. Yes, we all want more successful projects than failed projects. But good ideas are rare and hard to find. The best way to increase your longer-term success rate isn’t brute-forcing ideas to success, or worse, redefining what success means to meet your KPIs. The long game goal of innovation managers, mentors, and coaches should be focused on creating better entrepreneurs and innovators — not by chasing unicorns but decreasing the cycle time between ideas. This requires a deliberate and patient investment in leveling up your teams on new mindsets, skills, and playbooks for succeeding in the new world. Ideas then are vessels for leveling up your teams. You can’t afford to just focus on activities, skills, or traction. You have to focus on all three. Don’t build a better [x]. Build a better user of [x]. Don’t build better [innovation processes and tools]. The Root Cause for Innovation Theater and How to Avoid It was originally published in Love the Problem on Medium, where people are continuing the conversation by highlighting and responding to this story.